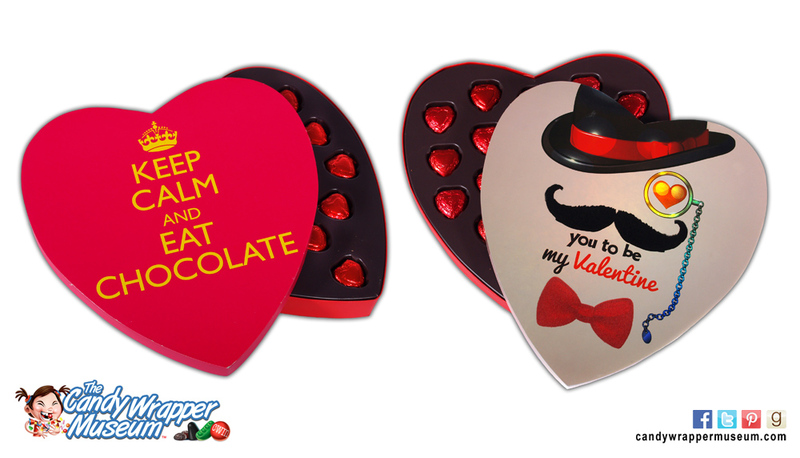 Show how big your love is with these Elmer’s candy boxes. As the days of our modern world whirl about us, every simple task seems to become more complicated, and Valentine’s Day is no exception. Any simple box of chocolates and flowers once would do, but now the candy shelves are packed with choices ranging from the inane to the mundane to the insane. Puzzled over what to pick? 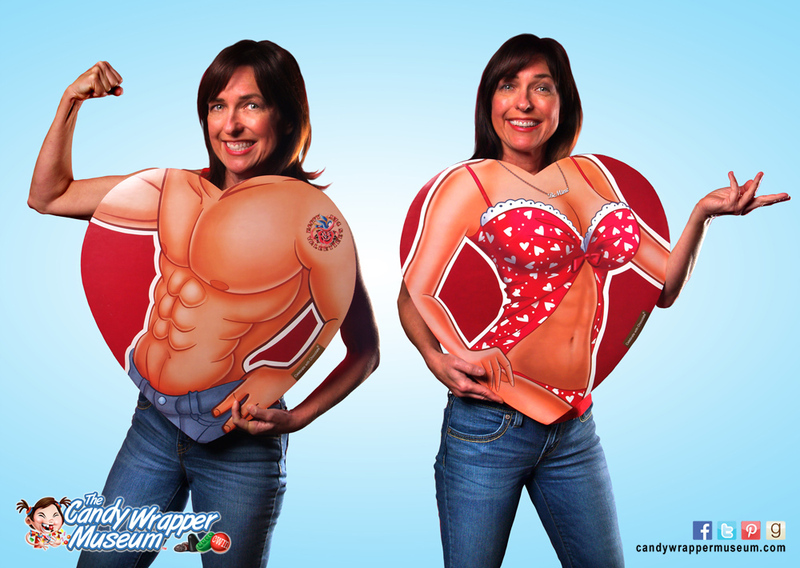 No need to worry– the Candy Wrapper Museum is here to serve as your guide to what’s hot. These are oh, so 2013. First, let’s back up and look at what was on trend last year: all things smart phones and apps. The world was going ape over apps. 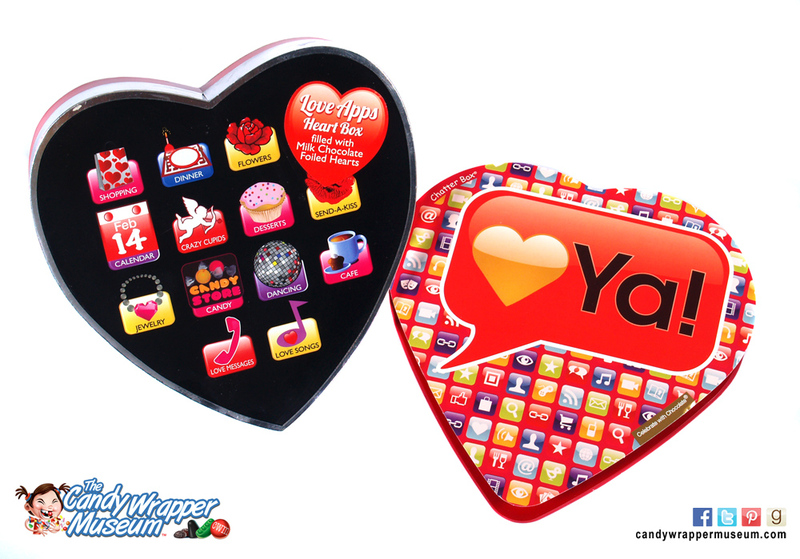 Why say, “I Love You” when “<3 Ya!” will suffice? People are busy– let’s not waste time! Say it with an emoticon or don’t say it at all. This year, the app craze with all its wee details has vanished and has been replaced with something big—BIG boxes. Perhaps the most laughable and/or disturbing are the “torso boxes” by Elmer Chocolates (modeled above to show scale by Yours Truly). Who wouldn’t love this? The men’s box takes things to the next level by depicting a torso that is evocative of other… shall we say… masculine parts of the body? Reflect the timeless quality of your love with one of today’s passing fads. Meanwhile, Frankford delivers with tributes to two of last year’s most annoying crazes, the “Keep Calm” and “Moustache” fads. Hurry to snap these up because chances are they won’t be around next year. I also saw moustache suckers on the shelves if you prefer to make your romantic statement that way, but it’s hard to top “Eye moustache you to be my Valentine.” As I write, I find myself confused about the bow. Is it part of the rebus? If so, the message is “Eye moustache you to be my Valentine beau.” Well, no need to overthink this. Nobody else is. One devastatingly romantic way to express your love. 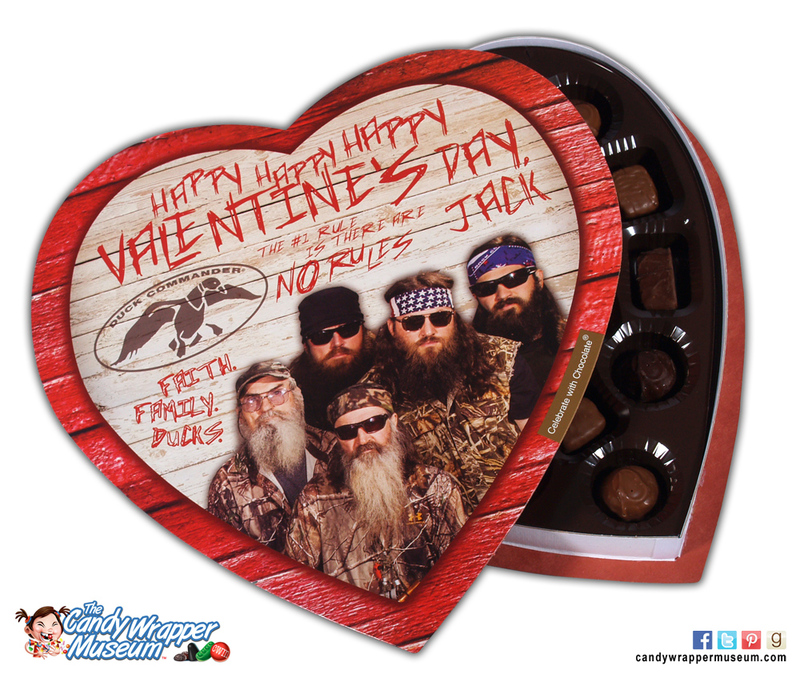 Love ‘em or hate ‘em, the Duck Dynasty guys survived scandal and are here to offer you this unbridled romantic offering. Will we see more candy from them next year? Stranger things have happened, but you might want to heed the duck call and get this happy happy happy candy while supplies last, Jack. Remember, when it comes to love, war, and candy, the #1 rule is there are NO RULES. Images of death and declarations of “Just Friends” are options for expressing yourself. Some trends have persisted over the last few years. One is candy for romantic also-rans. I realize that the BFF! 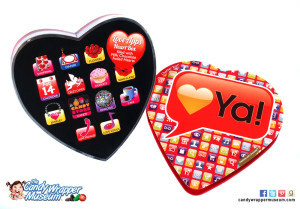 candy might indeed be an innocent gift for a friend, but I can’t help hearing the awful squishy sound the recipient’s heart being crushed when he or she receives this, and the nature of the relationship is made crystal clear with a big exclamation point. 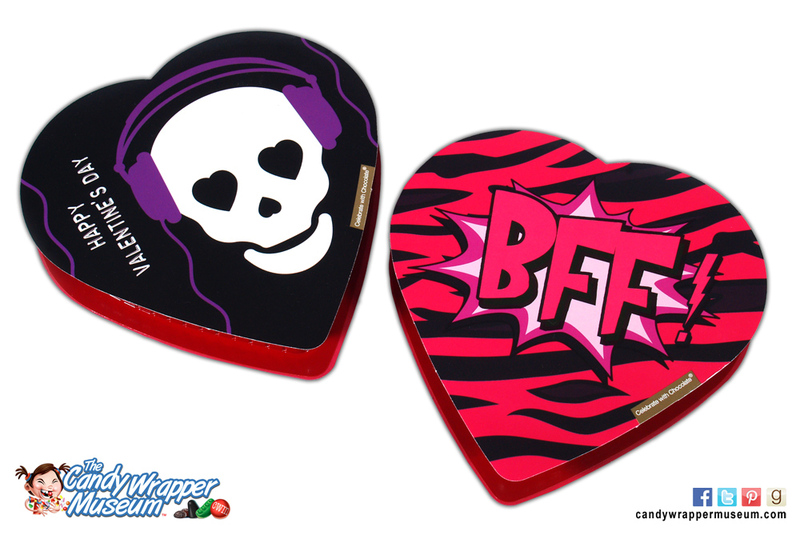 And although I know some people who would enjoy receiving a black box of candy with a skull and headphones (a sure sign of isolation) on it, this doesn’t appear on the surface to be the most encouraging token of affection on this day of romantic days. The gift for the woman who makes your life a living hell? 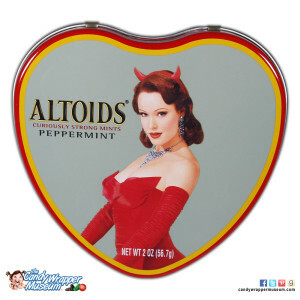 For those henpecked guys who must buy something for their woman but want to make a subversive statement at the same time, I suggest the devil woman Altoids. It looks pretty, but it’s a nice way to suggest that something smells in this relationship, and it sure ain’t you. Yes, there is indeed a rich spectrum of offerings this year to spark new relationships, stoke a fire under existing ones, squash one-sided loves, hedge on romances on the brink, and say nothing when that is better than saying anything at all. If none of these offerings grab you, you might prefer these tins available at Target. 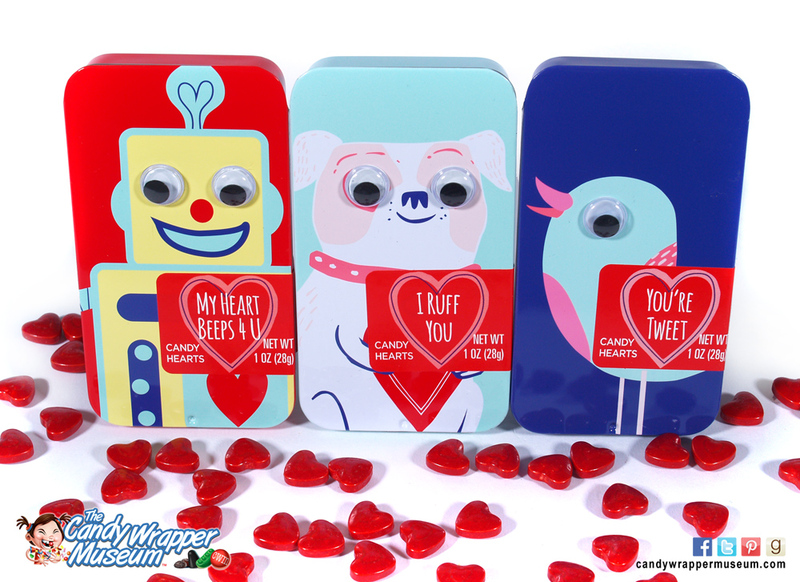 Cute robots, pugs, chicks, googly eyes, puns, and candy hearts are there for your picking. Cute, sweet, and that is all. I’ll take all three. Now the big question is: what am I going to do with all this candy?! 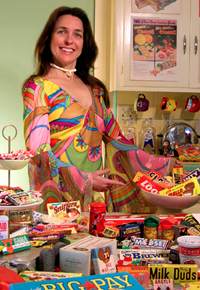 This entry was posted in Food and tagged Candy, Candy Wrapper Museum, Darlene Lacey, Valentine's Day. Bookmark the permalink.